Divorce can be difficult to navigate emotionally and it can also present financial challenges. You'll need to make informed decisions regarding the division of property and assets that you and your spouse accumulated during the marriage. Acting rashly could result in an imbalance between the two of you once those assets are separated. Retirement savings are one of the largest and most valuable assets many people own, and, therefore, are an important issue in divorce proceedings. Determining how to split retirement assets can be one of the most difficult aspects of divorce, as they may be subject to tax implications, and often not handled properly because of it. If you're planning to get a separation or divorce and your spouse has an employer-sponsored retirement plan such as a 401(k) or pension plan, you're legally entitled to part of the balance assuming that you do not have a prenuptial agreement that states otherwise. It also works the other way around: your spouse is legally entitled to part of your employer-sponsored retirement account value should you have one. But if your spouse was the primary breadwinner, how do you protect your share of his or her retirement account? What's to stop your spouse's employer from paying out the benefits to your spouse or ex-spouse, leaving you with little or nothing? The answer is generally a Qualified Domestic Relations Order. A Qualified Domestic Relations Order (also known as a QDRO, pronounced "quad row") can protect your interests under these circumstances. A QDRO is a court order, judgment, or decree related to child support, alimony, or property rights that can also instruct your spouse's pension plan on how to pay you your share of plan benefits. A QDRO gives you protection and guarantees that a marital settlement agreement does not by allowing the funds in the retirement plan to be separated and withdrawn without penalty and the deposited into the non-employee spouse’s retirement account (typically an IRA) or otherwise making provisions for payout. Don't assume your rights to retirement assets are covered just because your divorce decree states that you have a right to part of your spouse's retirement funds. But it is important to note that QDROs only apply to plans that are IRS tax-qualified and covered by the Employee Retirement Income Security Act (otherwise known as ERISA). They do not apply to military or government pensions, which are governed by other laws. You do not need a QDRO to divide IRA or SEP assets. A Domestic Relations Order is not considered Qualified unless it's been approved by the retirement plan's Plan Administrator and the court. Retirement plans often have standard QDRO forms that your lawyer can use to draft the wording of the QDRO. Sometimes these are adequate, but if your share of your spouse's retirement account is substantial, you should consider using an attorney who specializes in QDROs to ensure that all of the related issues in your marital settlement agreement are incorporated into the QDRO and that your rights are fully protected in a way that a generic QDRO form can't provide. If your attorney is not experienced in QDROs it will take him or her longer to do the research and paperwork, which will cost you more in legal fees. There's also the chance that he or she could miss something important that could end up costing you money. Another factor in the writing of a QDRO is the type of retirement plan in question. Defined contribution plan assets (like 401(k) plans) are easier to calculate than defined benefit plan assets (like pensions) because defined benefit plan payments are based on complex actuarial calculations and factors such as years of employment. If your spouse has this type of plan, your lawyer will probably have to hire an actuary to calculate your share of the plan assets. Your lawyer should read the retirement plan's summary plan description and other plan documents because the QDRO's terms must agree with the terms of the plan. The issues related to defined contribution plans are different than those related to defined benefit plans, another reason it helps to use a specialist. This is another area that tends to get complicated. In most states, funds added to retirement accounts during a marriage are considered marital property, meaning that both you and your spouse have a right to them. 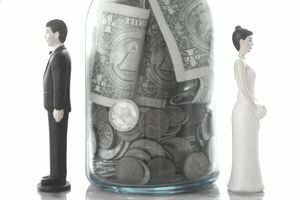 But if either of you entered the marriage with funds already in a retirement account, those funds are generally treated as separate property in a divorce (though their treatment varies state by state). As a general rule, the assets that are considered marital property, or those that were contributed during the marriage, along with their earnings are the assets that are divided in the event of a divorce. If your spouse is covered by a defined contribution plan, like a 401(k) plan, the timing of your payment depends on that particular plan. Some plans make an immediate lump sum payout and others pay a lump sum in the future or make periodic payments. If your spouse is covered by a defined benefit plan like a company pension plan, on the other hand, you are likely to receive monthly payments starting at your normal retirement age. It's important to understand how much you stand to gain from the division of retirement assets as you plan your financial life post-divorce. The amount, and whether you have other sources of retirement savings or income, can be used to determine your future retirement budget and how much work you may need to do to get back on track with your savings goal. Consider also whether you may need to tap into that money before retirement to meet day to day living expenses if you were the non-working spouse. You may be going back to work, receiving alimony or child support following the divorce but if not, retirement assets could act as a supplement until you're able to reestablish financial stability. Just be aware that withdrawing money from retirement plans before age 59 1/2 could trigger a 10% tax penalty and regular income tax. Divorce can be costly be in terms of upfront attorney fees and emotional health. But it can also have costly effects on your future financial security. Educating yourself is the first step. But be sure to take the appropriate legal steps to protect your rights and always employ a qualified team to help you do so.